A small tangent from costuming. But its Ren-related, so I think appropriate to post here. I have become enamoured with the idea of getting a lute and learning to play upon it. My dad and I started researching this weekend, and he's going to try to find out more from one of his friends that owns one. We're not sure if he plays yet, but if he does, all the better, as I'd have someone to ask questions. Teaching myself is fine, but knowing there is someone to go to when i'm stuck is better. 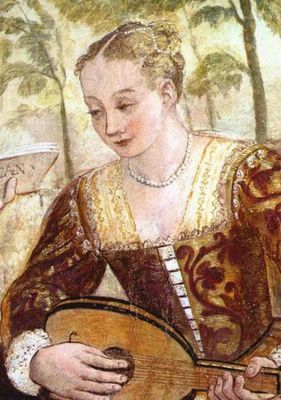 ;-) Anyway, I shall not bore others with too much of my research, but it looks as if a 6-7 course lute is the way to go for the period (meaning 6-7 pairs of strings), and last night I started searching for lute/vocal music for purchasing. I know, I know. A bit early to buy the music before the lute, right? Well....I actually found out how to tune myclassical guitar to lute tunings, and so could get a jump start if I want. Which I do. Now I just need to find my pesky guitar capo. I think it has resurfaced a few times since the move, but I've no idea where to look for it. I may be visiting the music store today. Oh, and if anyone reading this diary ( I know there are a few besides niter and beth) know anything about lutes, I would greatly appreciate helpful hints! Excellent! I have always wanted to learn the guitar. Though my brother has an awesome guitar he is not using, I feel it is a bit welchy to ask him for it (since the circumstances, for what i have gathered, are that he physcially canont play anymore). I am to be the only not muscially inclined courtesans. I suppose I will have to find antoher way to market myself. Giggle. Niter - want to use mine? It's not what you'd call a terrific guitar, but it has strings! And it is buried in my closet, where I stuffed it when I quit lessons....and it is probably lonely and dejected. I figured you'd be the poet of the group anyway. Julie - out-freaking-standing....luting luting luting...oh boy. Can't wait to see and hear the lute. I have no idea whether harp is appropriate to the time period. Maybe I should look. I'm not learning another dang instrument for this, but I could bring my lap harp to play. Let me know what kind of music you find. I bet I could work out some sort of harp arrangements. I am very excited to try the luting. At this point, logic tells me it still depends on funds. Um, and more importantly, on talent. Lets not get ahead of myself. Chuckle. I pulled out my classical guitar to tune like a lute and decided I should play guitar first. It was sad how much I'd forgotten. Mental note to practice more. Anyway, I ended up desperately trying to reteach myself greensleeves and never got as far as the lute tuning. ;-) Am saving that for another day. As for harp, I always thought/assumed it was period. But I have done zero research on the matter. One of my old madrigals is written for accompanyment by lute or harp, if that's any indication. Of course, who knows when they added in accompaniment. I also know a madrigal with lyrics supposedly written by Henry VIII. Though I can't find the sheet music... Its quite catchy, or maybe thats cuz i sung it twice at every madrigal concert for 4 years of college. It,likewise, could have hidden perversity. Not surprising considering the author. I suppose I should look for Italian, though. ;-) I have sent my music education major sister on a venetian renaissance music quest. We will see what she turns up.